An elementary school class started a class project to make planters to take home to their parents. They wanted to have a plant in it that was easy to take care of, so they decided to use cactus plants. The students were given green-ware pottery planters in the shape of clowns which they painted with glaze. 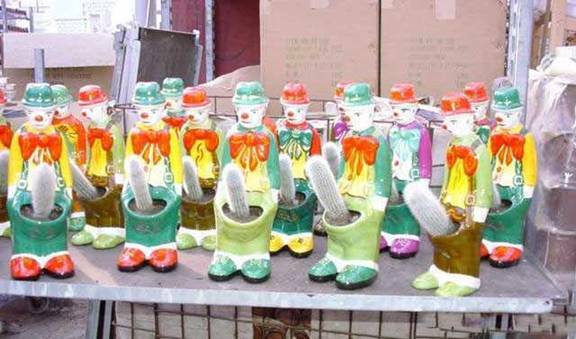 The clown planters were professionally fired at a class outing so they could see the process. It was great fun! They planted cactus seeds in the finished planters and they grew nicely, but unfortunately, the children were not allowed to take them home. them home instead. The teacher said cactus seemed like a good idea at the time! This entry was posted on 4 Nov, 2005 at 10:29 am and is tagged with , funny. Trackback. Oh dear. You can’t even pretend that’s innocent without laughing. Wonder what they told the kids the reason for change of plant was? The clowns even look dejected. You know, I kinda doubt the authenticity of the story. However it is very funny. I think that maybe these are novelty items. Judging from items in the background of the picture, this looks like a warehouse. The clowns are obviously enroute to their new owners and to cause even more laughter. I bet the workers at the warehouse really got a kick out of these. Wonder what they’d look like with ivy?